I hear from a lot of different readers who are following different diets for various personal reasons. One such diet is the vegan diet. The following question often arises: “Are vegan diets beneficial for Hashimoto’s?” Again, I believe that there is not one diet that is perfect for every individual, but I have found, through clinical and personal experience, that there are some potential concerns associated with a vegan diet that need to be considered if you are dealing with Hashimoto’s. Those following a strict vegan diet will eliminate any foods that come from animals, including meat, eggs, dairy, and even honey. Vegetarians, on the other hand, eliminate meat, but will often still consume dairy and other products that are derived from animals. Raw: Plant foods that aren’t cooked beyond a certain temperature, usually 118 degrees F, are consumed on a raw vegan diet. Raw foodists typically rely on dehydrated and sprouted foods to bulk up their caloric intake. Raw Till 4: Raw foods are eaten until 4 p.m., after which time, cooked vegan foods are incorporated. HCLF: Short for “high carb/low fat,” carbs in the form of fruits, grains, and veggies are consumed in large quantities. Fat-containing foods, such as seeds, avocados, oils, and other high-fat plant foods, are consumed in smaller quantities. 80/10/10: This version of a raw HCLF vegan diet sources 80 percent of calories from carbs (mostly fruit), 10 percent from protein, and 10 percent from fat. More recently, the term “plant-based” is being commonly used, and denotes any diet that leans heavily on plant foods, but may allow the occasional animal product to be incorporated. This term doesn’t carry quite the same political connotation as “vegan” does for some people, and allows for a little more flexibility and intuitive eating for many people. Reported health benefits of a vegan diet include weight loss, improved kidney function, possible protection against cancer, and a reduced risk of heart disease. It’s important to note, however, that the data surrounding the health benefits of vegan diets is inconclusive, and many of the benefits will be dependent on whether a person is eating a whole foods diet versus one that is full of processed foods. While incorporating a large amount of plant food into a person’s diet will certainly provide a multitude of health benefits for the majority of people, including increased micronutrient and fiber intake, my experience has shown me that an exclusively vegan diet is usually not the most helpful for people who are trying to heal from Hashimoto’s. Exacerbate blood sugar issues: Those with Hashimoto’s often experience blood sugar issues, which can be exacerbated by carbohydrate-heavy vegan and vegetarian diets. Prevent the gut from healing: Non-meat protein sources such as legumes (beans), dairy, grains, soy, nuts, and sometimes seeds, may prevent the healing of a leaky gut, as these foods are often found to be reactive in Hashimoto’s and can perpetuate intestinal permeability. Contribute to nutrient deficiencies that may exacerbate Hashimoto’s: Vegan diets put us at risk for deficiency for many nutrients, including vitamin A, vitamin B3, vitamin B9, vitamin B12, vitamin D, calcium, chromium, copper, iodine, iron, magnesium, carnitine, manganese, zinc and omega-3’s. To better understand how a vegan or vegetarian diet affects Hashimoto’s, I’ve examined the available research, conducted my own research, and observed the results from working with my own clients over the years. It has led me to a few conclusions. An often cited study by Seventh Day Adventists suggested that a vegan diet may be protective of thyroid disorders, but there were some findings in the study that led me to believe that it wasn’t the lack of meat, per se, that was beneficial. The study, which asked 97,000 church members about their dietary habits and health conditions, reported that people who followed a vegan diet were less likely to develop hypothyroidism, compared to those following the Standard American Diet. Interestingly, those who followed a lacto-ovo (dairy and egg) vegetarian diet were more likely to develop hypothyroidism, compared to those following the Standard American Diet. Based on this and my experience with most of my clients with Hashimoto’s, I believe that it’s possible that the reduction in hypothyroidism seen in the vegan diet was due to excluding dairy and eggs — two common reactive foods in people with Hashimoto’s. While autoimmune thyroiditis is usually associated with excess iodine, hypothyroidism can be induced by a lack of iodine. In fact, it is the leading cause of non-autoimmune hypothyroidism in the world, with over 30 million people estimated to be iodine deficient. Since vegan diets tend to be low in iodine, due to the avoidance of seafood, dairy and eggs, vegans can be at a greater risk of developing iodine deficiency-induced hypothyroidism. One study sought to determine the correlation between children following vegan diets and their risk for developing iodine deficiency and hypothyroidism. In this study, a young child who was on a vegan diet since being weaned from breastfeeding, was assessed and found to have hypothyroidism, due to iodine deficiency. This case highlights the risk for iodine deficiency in children on a vegan diet after the discontinuation of breast and formula feeding that could lead to acquired hypothyroidism. This, and similar studies, have highlighted the rise of hypothyroidism among children in parts of the world where vegan diets are on the rise. Those following a vegan diet may also be deficient in other key nutrients that contribute to health and are often lacking in people with Hashimoto’s. Iron is one of those nutrients — it is essential for thyroid hormone production, as it is required to convert T4 to T3, and is often deficient in people on a vegan diet. Beef or chicken liver and shellfish are all excellent sources of heme iron, a form of iron that is easily absorbed by the body. On the other hand, iron-rich plant foods, such as spinach, contain the non-heme form of iron, which is less readily absorbed and utilized by the body. 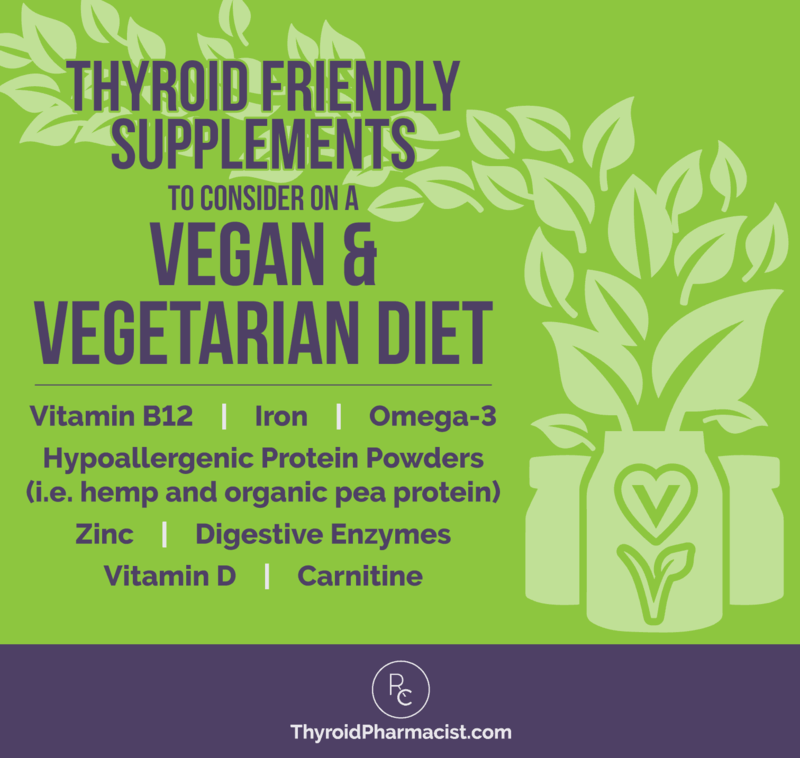 Many vegans will find it hard to absorb the required amount of iron from plant foods alone, putting them at greater risk for thyroid disease. A study conducted in Iran looked at the effect of low iron in young women by collecting urine and serum samples of iron deficient adolescent girls. Subjects with lower iron stores had a higher ratio of T3/T4, indicating an impairment in thyroid metabolism that can lead to hypothyroidism. The study also found that those with low iron levels had a higher concentration of reverse T3, which binds to thyroid receptors but turns them off instead of activating them, resulting in a lack of active T3 hormone to be used. (A lack of active T3 can result in hypothyroidism symptoms — you can read more about that here). The results concluded that iron deficiency may affect thyroid metabolism in adolescent girls, which may put them at greater risk for thyroid issues. Vitamin B12 is another nutrient that is essential to health, with symptoms of deficiency that include fatigue, memory loss, heart palpitations, constipation or diarrhea, muscle weakness, and vision loss. Because B12 is primarily found in animal foods, individuals following vegetarian or vegan diets are at a high risk for developing vitamin B12 deficiency. One study reviewed the reported B12 serum levels among individuals adhering to vegetarian diets across 40 different research studies. The B12 deficiency prevalence among infants fed a vegetarian diet reached 45 percent. The deficiency among the studied children and adolescents reached 33.3 percent, while rates of deficiency among pregnant women ranged from 17 to 39 percent, dependent on the trimester. Furthermore, up to 86.5 percent of adults and elderly individuals had a B12 deficiency. With few exceptions, the reviewed studies documented a relatively high prevalence of B12 deficiency among vegetarians, and even higher levels among vegans. My experience tells me that, while some vegans do experience a reduction in symptoms and reduced thyroid antibodies, those results are often explained by the elimination of eggs and dairy, which can be highly reactive for people with Hashimoto’s. In my own practice, I’ve sought out success stories to find Hashimoto’s remission stories. While the Adventist study sounded promising, and while I was able to find a great amount of information about the vegan diet helping other autoimmune conditions and diabetes, I have only been able to find one report of a person recovering from Hashimoto’s by following a vegan diet, in comparison to encountering close to a hundred Hashimoto’s remission stories based on the gluten free, Paleo, and Autoimmune Paleo diets. Many times, I’ve found cases of vegan Hashimoto’s remission stories, only to find that, upon deeper investigation, the person continues to struggle with symptoms such as low body temperatures, depression, brittle hair, irritable bowel syndrome, dry, pale skin, and numerous other symptoms associated with Hashimoto’s or inadequate nutrition. While I realized that my own health significantly improved with the use of nutrition, and I had a hunch that I was not the only person that could see improvements in Hashimoto’s with diet, I wasn’t fully convinced that one particular diet was the answer for every single person with the condition. When I began working with clients with Hashimoto’s, however, I noticed that most clients got better with a dietary approach that was very similar to my own. Again, not wanting to jump the gun and before I made “official” recommendations, I decided to conduct a survey of Hashimoto’s patients in 2015. I wanted to know how many people felt better with which dietary protocol, how many people felt worse, and how many people were able to reduce their thyroid antibodies with a dietary protocol. While I am a big believer in the patient experience, and I always recommend trusting your own body as a guide as to what is working best for you, I decided to include antibodies as an objective measure. Objective measures, such as a reduction in thyroid antibodies, are the types of evidence scientists and doctors prefer to track to determine the severity of a condition, and whether the improvements seen by patients are measurable and “real.” Generally speaking, the higher the amount of thyroid antibodies, the more aggressive the attack on the thyroid gland, so seeing a reduction in thyroid antibodies is a potential indication that the condition is becoming less aggressive. As far as the vegan diet, 30 percent of those on a vegan diet reported that they felt better, while 28 percent on a vegan diet felt worse. In contrast, more than 80 percent of people reported feeling better following a grain free and Paleo diet, while less than 5 percent of people reported feeling worse with these types of dietary protocols. Notably, the vegan diet did show a reduction in thyroid antibodies in my survey (23 percent saw a reduction in thyroid antibodies), and my hypothesis is that the antibody reduction resulted from the exclusion of dairy and eggs, two common reactive foods in Hashimoto’s (each food helped about 20 percent of people see a reduction in antibodies in my survey). In contrast, 33 percent of people reported a reduction by removing gluten, 27 percent by following the Paleo diet, and 38 percent by following the Autoimmune Paleo diet. As far as vegan protein sources, 44 percent of people who responded to my survey reported sensitivities to grains, 41 percent to soy, 15 percent to nuts, and 7 percent to seeds. Additionally, many of my clients, who were former vegans, have reported improved symptoms of Hashimoto’s following a transition to a Paleo diet. Based on this, I believe that animal proteins must play an important role in building back the health of people with Hashimoto’s. Some former vegans who were suffering from debilitating fatigue, because they weren’t eating a diet compatible with their needs, have been able to get their Hashimoto’s into remission by transitioning to a Paleo-like diet, and incorporating red meat into their lifestyle. In surveying my own readers, out of 595 people who tried to avoid red meat, 40 percent reported that avoiding red meat made them feel better, while 14 percent reported that avoiding red meat made them feel worse. So you may be wondering, what’s in red meat? That said, while meats and fats are important for healing, eating them exclusively will produce an acidic environment in the body, hindering healing. Therefore, one’s diet should be balanced with plenty of nutrient-rich vegetables (a suggested ratio may be 20 percent meat, 80 percent veggies). Additionally, vegan and raw vegan diets can be extremely helpful for cleansing and detoxifying, especially for those with persistent protein digestion issues (very common in Hashimoto’s). A vegan diet can be followed for a few days to a few weeks and may help the body detoxify. B12 and iron or ferritin supplements should be utilized at this time, to prevent deficiencies. Another approach may be to follow a “semi-vegan” diet or the “Morning Vegan” approach, where one eats primarily vegan foods (nuts, seeds, veggies) for breakfast and lunch but consumes a meat-based meal for dinner. Again, I believe that eliminating foods such as eggs and dairy will provide positive results for many people with Hashimoto’s on a vegan diet and could contribute to the improvement that they feel. Likewise, a move away from the inflammatory foods of the Standard American Diet will be beneficial to most everyone. However, from my survey results, personal experience, and working with thousands of people with Hashimoto’s over the years, I have found a way of eating that seems most beneficial for the majority of people. While going gluten, dairy and soy free is something I recommend for everyone with Hashimoto’s, a lot of people will find that they further benefit from a Paleo-style diet. The Paleo diet is effective for so many people because it removes many of the foods that cause digestive problems, such as grains and processed foods, and replaces them with nutrient-dense foods like nuts and seeds, vegetables, fruit, and eggs. Meat is also allowed, as is fish and other meat products (like organ meats). The emphasis is put on nutrient density, controlling blood sugar, and reducing inflammation. The theory behind this way of eating is that the digestive systems of humans have not adapted to today’s farming practices or to the ingredients and chemicals in modern processed foods. It blames the rise in chronic diseases, obesity, and allergies on the agricultural revolution, which added grains and processed foods into our diet. Different people have their own take on the Paleo diet, and some will include foods such as dairy, eggs, and peas, while others eliminate them. I don’t recommend dairy, as it is a highly reactive food for most people. Other foods you will need to evaluate on an individual basis, depending on any food sensitivities that you may have. I have developed my own version of the Paleo diet that I call the Root Cause Paleo Diet. It specifically eliminates the foods that tend to cause the most problems for those with Hashimoto’s, while adding in nutrients that help the body heal. It’s important to reiterate that, while this type of diet has proved to be beneficial to many people with Hashimoto’s, each person needs to assess their individual dietary needs and find the diet that works best for them. For many people, that will involve some level of food sensitivity testing to get to the root cause foods that are reactive for them. The flip side to using food as a method of healing is that we sometimes become so attached to a specific diet protocol, we lose the ability to determine whether or not a diet is beneficial to us, no matter the results. Some people may get stuck on the idea that their diet will heal all, and that if they just take out more foods, they’ll be healed. But, this isn’t always the case. While the symptoms you are experiencing could mean that you are having a reaction to certain foods, they could also mean that you have deficiencies in nutrients or digestive enzymes, or that you have other root causes like intestinal infections, toxicities or an impaired ability to handle stress. If you are following a vegan diet (or any diet, for that matter), it’s important that you continually check in with yourself. Are your symptoms getting better or worse? List them out. Get tested for food sensitivities. How are your thyroid antibody levels? Consider making changes to your diet to see what works for YOU. First, if you are motivated to be one of the rare exceptions to overcome Hashimoto’s while following a vegan diet, more power to you! I hope that this post offers some support and guidance as far as nutrient deficiencies, and I would love to publish your success story — please be in touch when you take back your health. If you wish to continue following a vegan diet, I suggest incorporating a few supplements into your protocol that will help address some of the nutrient deficiencies that can be common with a vegan diet and contribute to Hashimoto’s symptoms. If you’re a former vegan, vegetarian, or are thinking about adding more meat into your diet, I hope this will be helpful too! 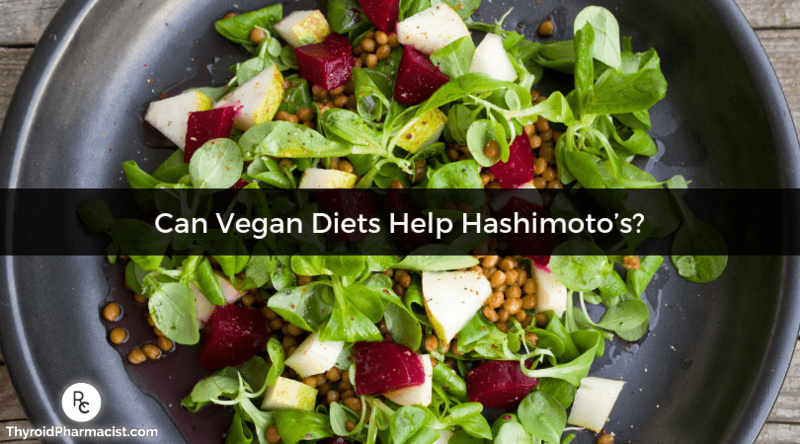 If you have eaten a vegan or vegetarian diet in the past, you may still be deficient in many of the nutrients that contribute to Hashimoto’s symptoms. Vitamin B12 is not made by the body and is found only in animal foods. Symptoms of B12 deficiency include fatigue, memory loss, heart palpitations, constipation or diarrhea, muscle weakness, and vision loss. I recommend taking a supplement, such as Pure Encapsulations B12 Liquid. Iron deficiency can result in hair loss, breathlessness, fatigue, anemia, and mood swings. Iron is not easily absorbed from plant food, as non-heme iron from plants is not as readily absorbed by the body compared to heme iron from meats. However, a diet high in dark leafy greens, lentils and peas will give you a significant amount of iron. Supplementation may still be necessary, and I recommend Pure Encapsulations Iron-C, which is formulated with vitamin C for better absorption. Omega-3 fats can be found in plant-based sources, such as chia seeds, flax seeds, walnuts, and hemp seeds, if nuts and seeds are not a problem for you. Alternately, you can supplement with a vegetarian source, such as with the Nordic Naturals Algae Omega Vegetarian omega-3 supplement. Those lacking Omega-3 fats in their diets may experience dry skin, eczema, mood swings, dandruff, or stiffness, so boosting one’s omega-3 intake may reverse these symptoms. Protein sources that are hypoallergenic may be challenging to find on a vegan diet. Yet protein is crucial for health, with deficiencies leading to muscle loss, fatigue, depression, fluid retention, and hair loss. For vegetarians, eggs, some seeds, and nuts would be the preferred sources of protein, but some people with Hashimoto’s may be intolerant to them. Pea protein is a vegan alternative that may be easier to digest and is less likely to cause food sensitivities. I developed the Rootcology Organic Pea Protein supplement for people who are looking for a plant-based protein that can be easily added to healthy smoothies. Hemp protein is also an option that’s well tolerated by some. Zinc can be found in legumes and grains; however, these are not tolerated by many people with Hashimoto’s. A lack of zinc can lead to poor wound healing, impaired T4 to T3 conversion, impaired smell, acne, and low alkaline phosphatase. I recommend supplementing with Pure Encapsulations Zinc Picolinate. Vitamin D deficiency can be a contributor to autoimmunity, with symptoms presenting as frequent illness, fatigue, hair loss, bone and muscle pain, and impaired wound healing. Vitamin D is best absorbed from the sun, but if you live in a less sunny climate and avoid animal foods, I recommend supplementing with Vitamin D3 Vegan Liquid by Pure Encapsulations. Carnitine is an amino acid that helps transport fatty acids in the body to be used as fuel, as well as move toxic compounds out of the cells, to prevent buildup. Carnitine has been found to be deficient in people with Hashimoto’s, and those on a vegan diet have an even greater potential for deficiency, as the richest source of carnitine comes from red meat. For this reason, I created Rootcology’s Carnitine Blend to combine L-carnitine and its acetylated form, into convenient capsules. Both L-carnitine and acetyl-L-carnitine can help to increase carnitine levels in the body, however, each form may have its own specific benefits. For example, supplementing with L-carnitine (2 grams per day) has been reported to resolve Hashimoto’s-related fatigue. L-carnitine has also been found to support antioxidant activities in the body. Acetyl-L-carnitine has unique brain-supportive properties and has been shown to help to reduce mental fatigue (and improve cognitive function) in various studies. People who are transitioning off the vegan diet and are starting to incorporate more meats into their meals should consider starting with broths before gradually introducing meat. Begin with easier to digest meat sources such as chicken and fish before transitioning to beef. Increasing your consumption of meat too quickly when the body isn’t used to digesting it could lead to stomach upset, bloating, constipation, and fatigue. Using digestive enzymes with meat, such as betaine with pepsin, may also help because protein digestive enzymes may be lacking in those with Hashimoto’s. In conclusion, I’d like to point out that I do believe that a well-adapted vegan or vegetarian diet can be much more beneficial to most people than the processed food-filled Standard American Diet. However, for people with Hashimoto’s, a Paleo-style diet seems to work best for the majority. Most importantly, try to put all of the diet dogma that we are constantly bombarded with aside, and focus on the foods that work for your body and make you feel better. This may take some experimentation, and a willingness to change course if what you are doing isn’t working for you. But, keep digging. You’ll get there! If you’re looking for strategies and recipes to help you feel your best, consider picking up a copy of my new cookbook, Hashimoto’s Food Pharmacology: Nutrition Protocols and Healing Recipes to Take Charge of Your Thyroid Health! The first few chapters will teach you how to support yourself through optimal diet, digestive enzymes, and proper nutrients. You’ll also find tools and strategies for success and 125 delicious recipes that will help your body heal and adapt to a thyroid-friendly diet. P.S. Be sure to sign up for my weekly newsletter to get a free book chapter, recipes, the Thyroid Diet Starter Guide, and notifications about upcoming events and my latest research! Yeliosof O, Silverman LA. Veganism as a cause of iodine deficient hypothyroidism. J Pediatr Endocrinol Metab. 2018 Jan 26;31(1):91-94. doi: 10.1515/jpem-2017-0082. Shaikh MG, Anderson JM, Hall SK, Jackson MA. Transient neonatal hypothyroidism due to a maternal vegan diet. J Pediatr Endocrinol Metab. 2003 Jan;16(1):111-3. Orlich M, Singh P, Sabaté J, Jaceldo-Siegl K, Fan J, Knutsen S, et al. Vegetarian Dietary Patterns and Mortality in Adventist Health Study 2. JAMA Intern Med. 2013 Jul 8; 173(13):1230–1238. doi:10.1001/jamainternmed.2013.6473. Eftekhari MH, Keshavarz SA, Jalali M, Elguero E, Eshraghian MR, Simondon KB. The relationship between iron status and thyroid hormone concentration in iron-deficient adolescent Iranian girls. Asia Pacific journal of clinical nutrition. 2006; 15(1), 50. Pawlak R, Lester SE, Babatunde T. The prevalence of cobalamin deficiency among vegetarians assessed by serum vitamin B12: a review of literature. Eur J Clin Nutr. 2014 May;68(5):541-8. doi: 10.1038/ejcn.2014.46. Ods.od.nih.gov. (2019). Office of Dietary Supplements – Carnitine. [online] Available at: https://ods.od.nih.gov/factsheets/Carnitine-HealthProfessional/ [Accessed 14 Feb. 2019]. Eleftheriou P, Kynigopoulos S, Giovou A, Mazmanidi A, Yovos J, Skepastianos P, et al. Prevalence of anti-Neu5Gc antibodies in patients with hypothyroidism. Biomed Res Int. 2014;2014:963230. doi: 10.1155/2014/963230. Cao Y, Qu H, Li P, Wang C, Wang L, Han Z. Single Dose Administration of L-Carnitine Improves Antioxidant Activities in Healthy Subjects. Tohoku J Exp Med. 2011;224(3):209-213. doi:10.1620/tjem.224.209. Kobayashi S, Iwamoto M, Kon K, Waki H, Ando S, Tanaka Y. Acetyl-l-carnitine improves aged brain function. Geriatr Gerontol Int. 2010;10:S99-S106. doi:10.1111/j.1447-0594.2010.00595.x. Malaguarnera M, Vacante M, Motta M et al. Acetyl-L-carnitine improves cognitive functions in severe hepatic encephalopathy: a randomized and controlled clinical trial. Metab Brain Dis. 2011;26(4):281-289. doi:10.1007/s11011-011-9260-z. Vermeulen R, Scholte H. Exploratory Open Label, Randomized Study of Acetyl- and Propionylcarnitine in Chronic Fatigue Syndrome. Psychosom Med. 2004;66(2):276-282. doi:10.1097/01.psy.0000116249.60477.e9. Thank you for the very informative article. My daughter has a general autoimmune marker and volatile thyroid levels depending on what she eats or what meds she was given. Her gut has healed through diet (GF, GMO free, chean meats, and avoiding cow meat and dairy), and working with herbs and adaptagens. She now seems to be able to digest sheep and goat dairy. Is that because of the casein being different? Have you found some people with thyroid disorders being able to digest sheep or goat dairy? Suzi – thank you for sharing your daughters journey. I am so happy to hear she is taking charge of her health and feeling better. <3 You should be able to add most foods back within three to six months after healing your gut. Exceptions would be gluten, dairy, and soy. Everyone is different, some people may need to eliminate all three of those foods indefinitely. The kinder you are to your gut, eating nurturing foods, taking probiotics, and undergoing infection protocols, the more you should start seeing an improvement in gut function. You should also be monitoring how your bowel movements look. Your stools should be well-formed and brown in color. If they’re too light or too dark, that could be an indication that your gut is not functioning properly. Make sure that your food is well-digested in your bowels and are not in particles, as well as ensure that you’re not alternating between constipation and diarrhea. Watch your bowel movements, monitor how your stomach is feeling, and make sure you are not experiencing constipation, diarrhea, stomach pains, acid reflux or bloating—these are indications that your gut still needs to do some healing. As your gut heals, eventually you will be able to start tolerating more foods. Here are a couple of articles you may find helpful. I adopted a diet similar to what you suggested and it did bring my antibodies down. I had my thyroid removed due to suspicious nodules. They were not malignant. Thank God. Now I am wondering how strict I need to be with the diet since thyroid is gone. I have fallen away from what I was doing. I want to prevent chronic diseases and cancer. What are your thoughts? Susan – thank you for following and for sharing your journey. I am so sorry you are struggling with this. My heart goes out to you. <3 Most thyroid conditions result from the immune system attacking the thyroid because the immune system is out of balance. Hashimoto’s is a complicated condition with many layers that need to be unraveled. While conventional medicine only looks at each body system as a separate category and is only concerned with the thyroid’s ability to produce thyroid hormone, Hashimoto’s is more than just hypothyroidism, it's an autoimmune disease that needs to be managed. Whether you have all, part or no thyroid, the autoimmunity still persists in most cases. We need to re-balance the immune system which begins in the gut. With the exception of discussing proper thyroid medication dosing, the majority of my website and book's focuses on balancing the immune system. The info I present is based on my own research and journey overcoming my autoimmune thyroid condition. Information is invaluable in knowledge and choices in regards to overall health for all. Autoimmune thyroid disease runs in my family, usually Grave’s, but I’ve had Hashimoto’s for 7 years. Used to be lacto-ovo vegetarian, and vegan, and raised 3 strong, healthy, athletic kids on a mostly vegan diet. I am having some issues with elevated insulin and glucose levels, so am limiting processed carbs now, but is it really necessary to eliminate all soy, dairy, and legumes? I’ve always thought these were healthy foods for someone like me with familial hypertension and high cholesterol. Beans are wonderful sources of complex carbs, fiber, and many B vitamins. My Irish and German ancestors evolved to be able to digest dairy easily. My entire 63 years of living, I have never had any digestive system issues whatsoever, and can eat anything and everything without a problem. Does that mean I can eat what I want without making my thyroid disease worse? Currently, I take 50 mcgs of brand-name Synthroid, and feel pretty well most of the time. Last checked, my TPA level was around 800, but that’s been several years ago. Colleen – thank you so much for reaching out and sharing your journey. Recovering from adrenal fatigue and hypothyroidism when following a vegetarian diet is very challenging, as vegetarian diets are often carbohydrate heavy. Vegetarian sources of protein such as legumes (beans), dairy, grains, soy and some seeds may be incompatible with trying to heal a leaky gut, which is almost always present with Hashimoto’s. Pea protein is an alternative that may be easier to digest and is less likely to cause food sensitivities. Eggs, some seeds, and nuts would be the preferred sources of protein for vegetarians. However, some people with Hashimoto’s may be intolerant to those as well, especially in the early stages of starting a healing diet. Being a vegan is even more challenging, and nuts and seeds would be the go-to source of protein, which are usually too difficult to digest for many in the beginning of their thyroid healing journeys.